Howdy folks, we’re going to start drafting the December edition of the meetup organizers newsletter — if there are any topics you’d recommend we include, or any interesting meetup event formats you think are worth highlighting, could you please comment leave your ideas/suggestions in the comments on this post? I will leave the comments open for one week until the 12th of December 2018. Meetup organizer newsletter suggestions for November? Friends, we’re about to start drafting the November edition of the meetup organizers newsletter — if there are any topics you’d recommend we include, or any interesting meetup event formats you think are worth highlighting, could you please comment on this post by the end of this week? Also, if anyone would like to volunteer to post a call for suggestions at or around the 5th of every month, that would allow us to keep collecting suggestions with a little more time to spare. While this is a bit late in the month, so we will be publishing the newsletter on Monday, November 26 2018. Friends, we’re about to start drafting the October edition of the meetup organizers newsletter — if there are any topics you’d recommend we include, or any interesting meetup event formats you think are worth highlighting, could you please comment on this post by the end of this week? Some examples of newsletters are here and here. If you’d like to recommend an interesting event format (preferably tried and tested by a group in the chapter) or suggest an additional topic to include in the newsletter, please leave a comment on this post! We try to send the newsletter out pretty close to the 15th of every month, so if we don’t get your suggestion in time to add it to this month’s email, we’ll consider it for next month’s email. In an earlier post about how to assist dormant Meetup Groups, we kicked around some ideas on how to support meetup organizers in their essential community work, especially if they are struggling or suffer from burn-out. 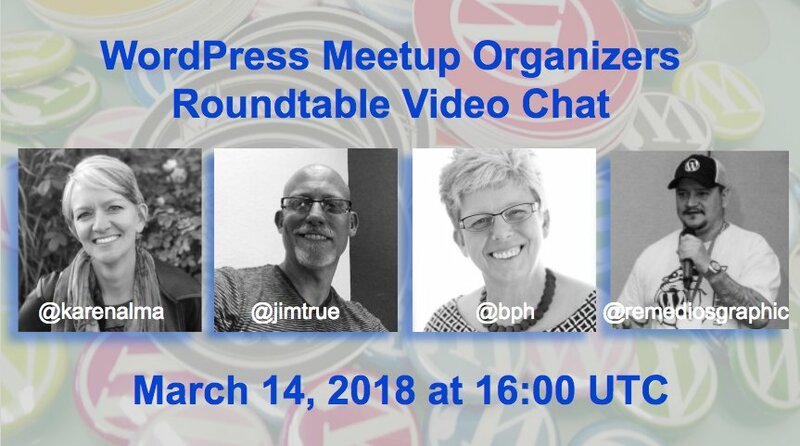 As a test, experienced meetup organizers will host four Meetup Roundtables. 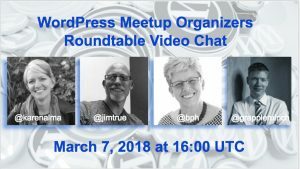 Kathy Drewien, Roberto Remedios, Jim True and Ulrich Pogson have already agreed to be our hosts, and we are recruiting a couple more people right now! 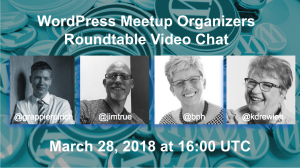 The Meetup Roundtables are an opportunity for Meetup organizers to connect and discuss challenges and opportunities for their local Meetups. We’ll hold them via video chat, using Zoom. What were the more popular topics in 2017 and 2018? How did you find your venues and strategic partners? The format is quite informal. We’ll kick-off the meeting with introductions, name, and location. 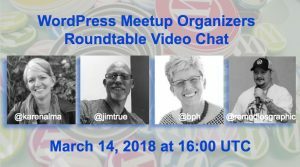 The hosts will talk about their experiences for this week’s topic for a few minutes, and then we open it up for general Q & A from participating organizers. 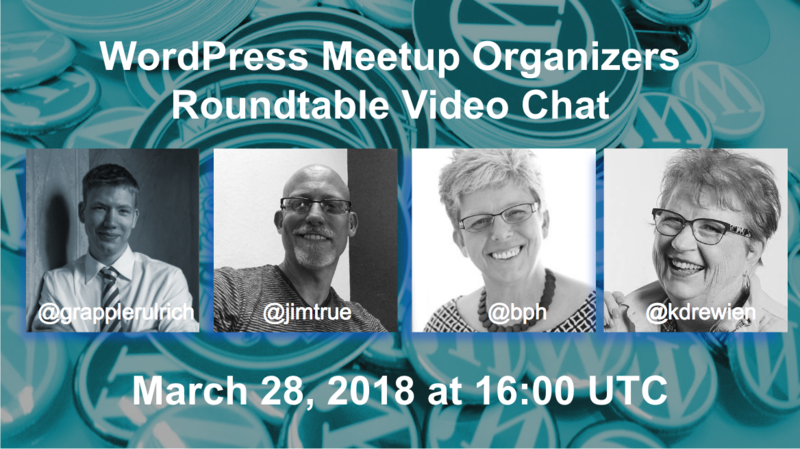 For this first round, we’ll plan for these video chat Meetup Roundtables to last one hour. We will record them and make them available for those that couldn’t make it. We hope you can join the discussion! 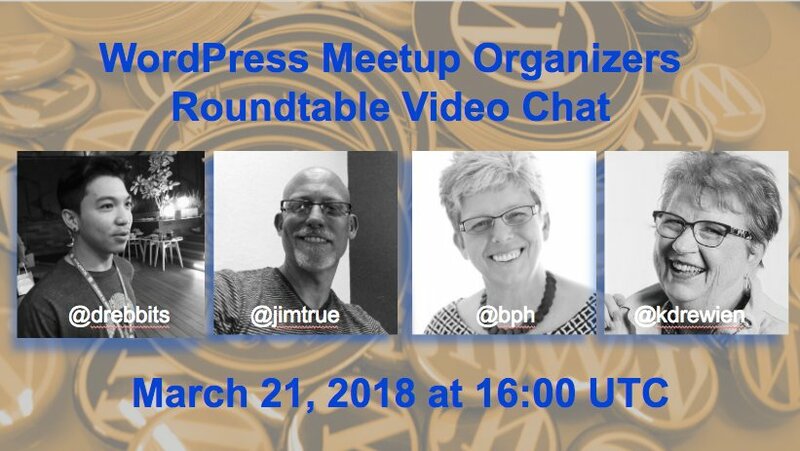 If you’re an experienced meetup organizer in the WordPress chapter program and would like to participate as a host, please comment below! Interested in learning more about WordPress Meetups? The Automattic sponsored staff members of the Global Community Team, who routinely handle WPCS banking, will be at a company offsite September 11-18. During this time we’ll halt WordCamp and Meetup vendor payments, reimbursements, and sponsor payment attribution. If you’ll need to pay for goods or services in mid-September, please submit all requests no later than 9am Pacific Friday, September 8, 2017. Payment requests submitted after that time will not likely be processed until Tuesday, September 19, 2017. Sponsor invoices paid September 11-18 won’t be marked paid until September 19. If you have an urgent payment request that must be handled that week, but did not submit your request prior to September 8, please reach out to @kcristiano. He can be found on slack “@kcristiano“. 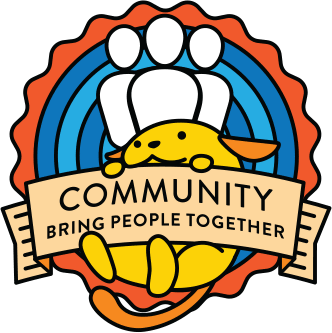 Deputies, mentors, and community members will still be available by email at support@wordcamp.org or on Slack in the #community-events channel. Normal vendor payment and sponsorship attributions scheduled will resume Tuesday, September 19, 2017 though it may take us a day or two to get fully caught up.